Ball Aerospace is offering a tour of their Boulder facility on Thursday, June 2 at 4:00pm. The tour will depart by bus from the main entrance of the Omni Interlocken Hotel at 3:30pm and return back to the hotel at approximately 5:30pm. 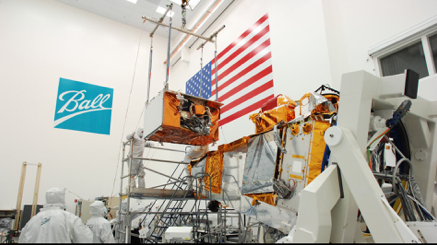 Come learn about the Worldview satellites that provide images to Google, the James Webb Telescope mirrors and radiators and JPSS-1, and the next polar-orbiting weather satellite with integrated instruments! The tour will also explore Ball’s vibration lab, thermal vacuum chambers, clean rooms, and manufacturing centers. Attendees must be U.S. Citizens or U.S. Permanent Residents. Government ID (Driver’s License) is required at check-in. The tour is limited to the first 30 respondents! Must be a registered NSRC-2016 participant to sign up (conference registration here: nsrc.swri.org). Please RSVP to Peggy Irwin at pirwin@ball.com.